There's an easy way to get a rough sense of the contours of the electoral map: just assume that the states will move uniformly with the national popular vote. If the Republicans gain a point nationally, they'll probably gain a point in each state. This is called “uniform swing” and it provides an essential baseline for gauging the basics of the electoral map. That's because past election results can often provide a better understanding of the race than sparse polling, which might accidentally send a state like Tennessee into the toss-up column without proper context.The FiveThirtyEight model's "fundamentals" function in this same way, keeping Tennessee or Michigan out of the toss-up column when an occasional spring poll shows an implausibly competitive race. But there's a danger here for political forecasters: States don’t move in exact unison, and if you're beholden to the uniform swing, you might ignore important shifts in political geography, the kind that sends states like Virginia into the toss-up column and West Virginia toward the GOP. Sectarian candidates, new issues, or demographic changes can send certain regions or demographic groups away from the rest of the country, propelling attendant states along for the ride. 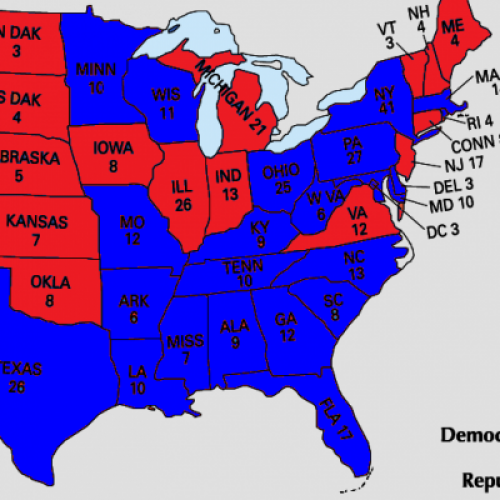 After all, the electoral map looks nothing like it did in 1976, even if states moved in approximate uniformity in the intervening elections. As a result, there is a margin of error in the uniform swing, especially in elections where big coalitions collapse. Most recently, when Clinton’s 9 point lead vanished in 2000, Gore’s losses were concentrated among rural voters; that left Gore successful in the traditionally competitive suburban northeastern states and California, but defeated in traditionally Democratic West Virginia and routed in historically competitive states like Kentucky. As the country becomes more diverse, the odds favor one or two swing states drifting in or out of the tipping point column in any election cycle where the demographic composition of each party’s coalition changes. New Mexico, for instance, may bob in and out of contention depending on Republican strength among Latino voters. The bottom line is this: While the uniform swing provides a solid baseline for the Electoral College, it is structurally assured to miss the state that deviates from its past—and that state might decide the election. So what does this mean for 2012? If it's a close election, as we expect, then Obama's once-broad coalition will suffer big losses, and those losses will be felt more acutely in some places than in others. Working class whites have abandoned the President en masse, but minorities and college-educated whites continue to offer elevated levels of support. Romney hasn’t yet consolidated these undecided white working class voters, but he will if this election is as close as the fundamentals suggest. This narrow but deep blow could reverberate across the electoral map—leaving Obama endangered in predominantly white working class Midwestern states where his current standing is lodged near or beneath 50 percent, but surprisingly resilient in the Mid-Atlantic and Southwest, where Democratic fortunes turn on the “new coalition” of well-educated and non-white voters. Unsurprisingly, the state polling doesn’t bear this out with precision—losses among a group as diverse as “white working class” wouldn’t be expected to be distributed evenly across the country—but there is more than enough evidence to take it seriously. Obama appears to have suffered big losses in states like Iowa and Michigan. New Mexico, the most diverse of the traditional swing states, is not competitive. Obama has given up on the close white working class states like Indiana, Missouri, and Montana, while North Carolina and Iowa are among the closest states so far in 2012. At a certain point, analysts should stop imposing the past on the present. There’s a legitimate debate about when exactly that should happen, but that point has probably come and gone in this election, where demographics, polls, and campaign behavior combine to dispel any doubts about the way 2012's electoral map differs from 2008's.